This package contains 12 Panavia Tornado GR1/GR1A and GR1-T models and paints for 40 aircraft, representing 13 and 45 Squadrons and 40 from the Tri-national Tornado Training Establishment (TTTE), circa 1990. The aircraft were produced for Ian McCartney’s work in progress scenery for P3Dv4 of RAF Honington (13 and 45 Sqns) and RAF Cottesmore (TTTE). 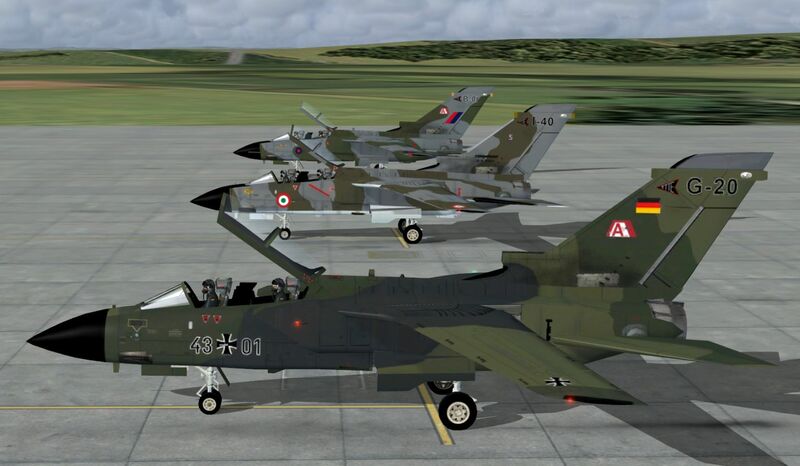 A separate package for FSX and P3Dv4 is in “JYAI Panavia Tornado GR1’s UK for FS9.zip”.